This bolt action operated CO2 pistol is a great starting point for any budding new shooter, the 12g CO2 operated pistol features an attractive wooden grip which give great the pistol great balance and feel in the hand it also comes complete with adjustable rear sight. The light weight alloy bolt is easy and simple to use making the pistol suitable for all users. 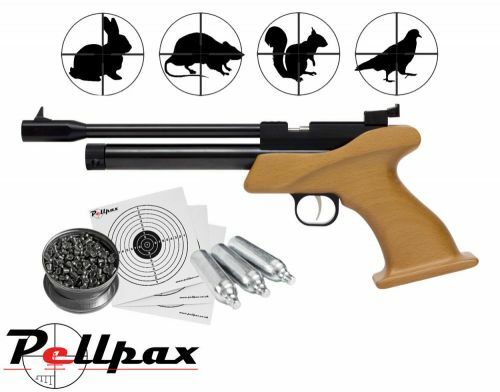 To get you shooting straight away we'll also include 10 x 12g CO2 capsules a selection of paper targets and a tin of pellets to get you started. Add this item to your basket & spend an extra £428.01 to apply for finance.